Bali Hash House Harriers 2 – What is Hashing? The Bali Hash House Harriers 2 group is one of the loosely affiliated international groups of non-competitive social running clubs fashioned after the traditional Hare and Hounds games originating in England. Enthusiasts refer to themselves as “hashers” and to the activity itself as “hashing”. In the context of the Bali Hash House Harriers 2 or BHHH2, these terms have nothing whatsoever to do with the “other” hash that in some places of the world is smoked. Although the parameters that each group sets may differ, in general, a person or persons setting the trail, called the Hare or Hares, sets a trail or trails and is followed by the pack of other people called the Hounds. At the run’s conclusion, Hashers typically eat, drink and socialize together. The group typically gets together in what is referred to as The Circle to humorously note on-trail misbehavior with tongue-in-cheek songs and “down downs”. The down downs are a form of drinking where one is generally expected to empty the contents of a glass, can or bottle from start to finish. Although down downs are not required to be done utilizing beer and may be done with any beverage of choice, beer is often utilized. Hashing is a mixture of athleticism and sociability, hedonism and hard work; a refreshing break from the nine-to-five routine. Hashing is an exhilaratingly fun combination of running or walking, orienteering, and partying, where bands of Harriers and Harriettes chase Hares on anywhere from six to ten (sometimes longer) kilometer trails through towns, country, jungle, and desert, all in search of exercise, camaraderie, and good times. It’s kind of like trail running but with fun at the end of the run. Bali Hash House Harriers 2 is a mixed gender, family friendly hash group, whilst some hashes are male only or female only. The original club in Malaysia is still active, being named the Mother Hash, and is a mens only hash. Mother Hash will be hosting the 80th Anniversary Run in September 2018 in commemoration of the founding of Hash in 1938. An interview with one of the founder members. Cecil Lee, reveals that it might well have been a tongue-in-cheek reference to the doubtful food served at the drinking hole frequented by the colonial bachelors of the time. Reports claim that the Hash began in early 1930’s, but under precisely what banner and whose direction nobody is quire certain. The late A.S. Gisbert (known only as “G”) was the real power force – albeit accidentally in the initial stages behind the Hash’s development as we know it today. Following an excessively indulgent party at the Selangor Club one Friday night. “G” decided to haul his ample frame around the sports field, thus hoping to balance out the law of increasing supply and diminishing output. Gradually others followed suit, and Cecil recalls that by the end of 1938 the Hash House Harriers were launched. Such was the determination of “G” to keep this going that he coerced friends into supporting him on a regular basis. Runs were scheduled as a weekly event and Cecil Lee, ‘Horse’ Thomson, ‘Torch’ Bennett, Eric Galvin and later Philip Wickens were the founding fathers. But, as so often happen, good intentions led to evil ends, and the small group began to slake their thirst with generous quantities of beer at the end of each run….. one beer led to another, an institution was born, and (not surprising) the Hash grew in numbers and stature. 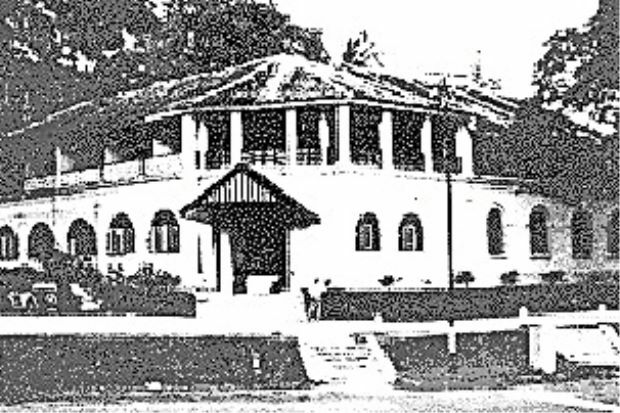 The permanent venue of those early meetings was the Selangor Club in Kuala Lumpur. Although no proper records were kept of the early runs, it would seem that the 100th Run took place on 15th August 1941. ‘Torch’ Bennett (an accountant by profession) undertook the responsibility of opening a bank account and entering a balance sheet, and thereafter records are more organized. The runs themselves ventured out in to the country, with the now familiar pattern of ‘hounds’ chasing a ‘hare’ (alias, paper trail). The Ampang and Maxwell Road districts were popular run areas. Cecil remembers, where they were greeted with many startled indigenous faces at this extraordinary, foreign behavior! 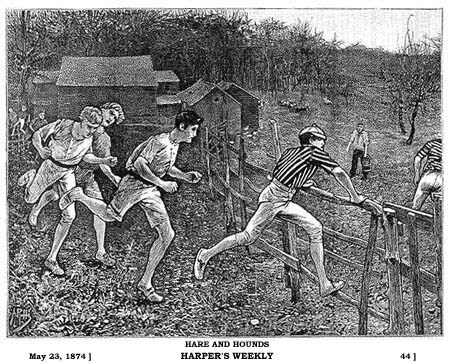 Hash House Harrier runs were patterned after the traditional British public school paper chase. A “Hare” would be given a short head start to blaze a trail, marking his devious way with shreds of paper, soon to be pursued by a shouting pack of “Harriers.” Only the Hare knew where he was going . . . the Harriers followed his marks to stay on trail. Apart from the excitement of chasing down the wily Hare, solving the Hare’s marks and reaching the end was its own reward, for there, thirsty Harriers would find a tub of iced-down beer. Hashing died during World War II (Japanese occupying forces being notoriously opposed to civilian fun), but came back to life in the post-war years, spreading slowly through Singapore, Indonesia, Australia, and New Zealand, then exploding in popularity in the late 70s and early 80s.